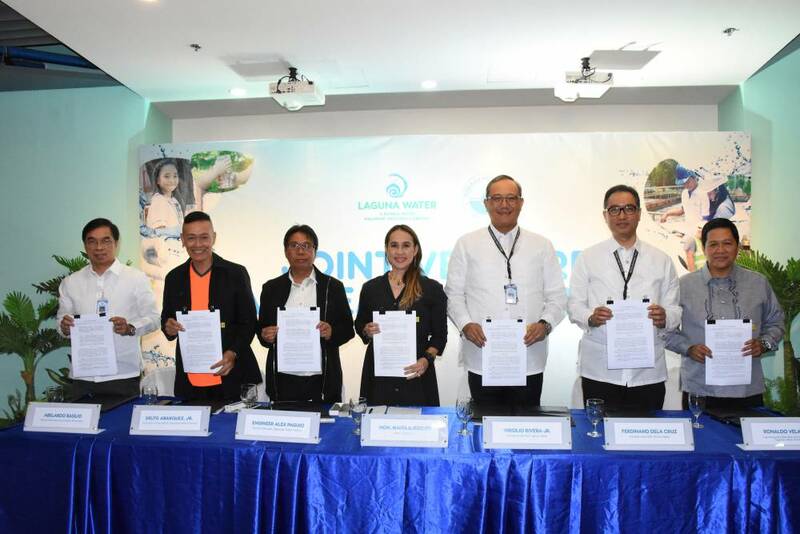 Laguna Water signs joint venture deal with Pagsanjan Water District | Manila Water Company, Inc. In photo: Manila Water Subsidiary Operations Group Director Abelardo Basilio, PAGWAD Chairman of the Board Delto Abarquez, PAGWAD General Manager Engr. Alex Paguio, Pagsanjan Mayor Maita Ejercito, Manila Water Philippine Ventures President Virgilio Rivera, Jr., Manila Water President and CEO Ferdinand Dela Cruz, and PAGWAD Engineering and Operations Division Manager Ronaldo Velasco. Laguna Water, a public-private partnership between the Provincial Government of Laguna and Manila Water Philippine Ventures, signed a joint venture agreement (JVA) with Pagsanjan Water District (PAGWAD). Under the agreement, PAGWAD grants Laguna Water the exclusive right to implement the design, construction, rehabilitation, operation, maintenance, financing, expansion and management of water supply services and sanitation services in the former's service area. During the signing of the joint venture, PAGWAD General Manager Engineer Alex Paguio shared that Laguna Water has always been the water district’s partner in addressing concerns on their water services. He said that the partnership will help realize its vision to provide the municipality of Pagsanjan and its environs with safe, clean, and potable water supply. Aside from improving the water operations, the joint venture will make sanitation and environmental services, such as septage management, available and accessible to its concessionaires, thus ensuring protection of the environment and promoting good health and well-being of communities. With the authority to operate the water and used water services of PAGWAD, Laguna Water commits to deliver 24/7 water supply that is compliant with the 2017 Philippine National Standards for Drinking Water. The JVA is also seen to reduce water losses and increase water pressure through various network rehabilitation projects. To ensure provision of quality services, Laguna Water will develop additional groundwater sources to meet rising demands, expand its water network to cover all communities in Pagsanjan, and implement sanitation programs to comply with various Philippine laws and regulations. In her speech during the signing event, Pagsanjan Mayor Maita "Girlie" Ejercito expressed her excitement with the joint venture and her high hopes that the partnership with Laguna Water will bring positive impact to the fast-growing economy of the municipality of Pagsanjan. She also highlighted that as the partnership ensures provision of safe and sustainable water supply and reliable sanitation and environmental services, she looks forward to seeing the significant transformation in the lives of the people of Pagsanjan. Meanwhile, Manila Water Philippine Ventures President Virgilio Rivera, Jr. expressed his gratitude to PAGWAD and the municipal government of Pagsanjan for trusting Laguna Water to be their partner in their water and sanitation initiatives. Committed to provide superior and reliable customer services, Rivera said that the joint venture is a testament of what can be achieved when the private and the public sectors work together.